Links to all the ways you and your kids can help, nationwide! Now that the holidays are approaching here's your chance to give back to the community that doesn't cost any money -- all you need to do is give your time. In these challenging economic times, it is especially important for parents to teach our children about helping those less fortunate than ourselves. And what better time than during the upcoming holiday season that includes Thanksgiving, Chanukah, Christmas, Kwanzsa, and New Year's would lending a hand to others give those who benefit more hope and happiness? Big Sunday - Thanksgiving, Christmas & New Years Volunteer Projects Available Throughout Los Angeles & Southern California. Click on Gift Package for a downloadable list of Big Sunday Holiday volunteer opportunities to help in November and December in Los Angeles and the adjacent counties surrounding it. Includes all the details and where to sign up. And in New York City, check out this opportunity for you and your kids can visit a nursing home on Christmas Day. Volunteers (both adults & kids, depending on the project) Are Needed Throughout the U.S. If you don't see opportunities to help in the city you are closest to in this blog check VolunteerMatch 's site for your local area. Their website providing a free matching systems and lists a huge array of community service ideas that you can search by region. My own family -- DH, all four kids (including triplets, plus one more all born within a year) and I -- have been volunteering for Big Sunday, an awesome non-profit that involves 30,000+ volunteers each year, annually since our now-tweens were 3 years old. We've always helped at both the Nov/Dec holiday volunteer projects and every May for the original Big Sunday. Thanks to our involvement with this organization, we've helped with many different community projects, including packing holiday care packages for the homeless, decorating a big hall for a Christmas dinner for the homeless, walking dogs at Boxer Rescue of So. 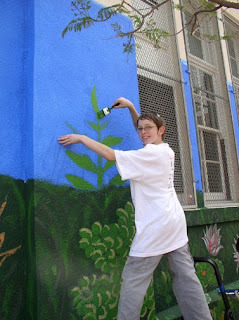 Calif, and painting the stables at a Horse therapeutic riding center, just to name a few. The pictures in this post show my family helping on various volunteer projects. 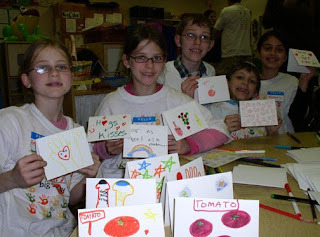 We've also written letters to U.S. troops to show our support, made potholders for the solar cookers used by the people of Darfur, and made cards and flower arrangements which we delivered to residents of old age homes. We'll be there again both to help out around Thanksgiving and for all the December holidays -- it feels so good to give back to the community we live in and our kids are learning to help others naturally, not as something they are forced to do. Please leave a comment if you know of other holiday community volunteer opportunities, giving us the link and we will be happy to add it to this list. And most important - Bookmark this site and keep checking back as I hope to add many more volunteer projects from across the U.S. and will post details, time permitting. Hi Janis, great post on volunteering for the holidays! It's fantastic to learn that you and your family are committed to making the holidays about giving back! Thanks Victoria for helping me promote families with kids volunteering this holiday season. I will add your website to this post as an additional resource.